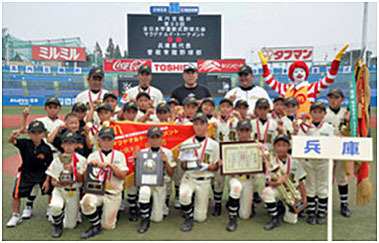 Sone Seiryu BBC (Hyogo Prefecture) took first place in its first competition of 33rd edition of 12U tournament by 51 prefectural champions at Meiji Jingu stadium in Tokyo on August 12, 2013 by defeating JBC Takashiro (Mie Prefecture) 1 – 0. The 5-day Championship, also known as “Koshien of Primary School”, started on August 7 under the scorching sun. The team members of Sone Seiryu BBC, are boys and girls of Sone Primary School in Takasago City, Hyogo Prefecure which is located in a village of only 800 residents and manager Nishio was rewarded with the honor in his 6th year on the job.